The rooms customarily occupied by the New York County Marine and Circuit Courts, located next to Manhattan’s City Hall, fell silent on the morning of Tuesday, May 5, 1857. Judge Henry E. Davies presided over the Court of Oyer and Terminer, which, due to the immense public interest in the murder trial at hand, had been moved to the more spacious accommodations. Judge Davies, who within ten years would become the most powerful judge in all of New York State, cut a swarthy, handsome figure at the bench. An elegantly upholstered backdrop framed his clean-shaven, chiseled face. The responsibility thrust upon him was immense: public outcry over the death of Dr. Harvey Burdell, allegedly at the hands of his lover, Emma Cunningham, was greater than any case heard in the city for the past twenty years. The political consequences for Democrats and Republicans alike could be disastrous if the defendant managed to escape the gallows. The judge’s bench glowed from the light cast by matching double-globed lamps. Natural light also flooded the room from tall windows, supplemented by wall sconces and the shine from an elaborate oil-lamp chandelier. Looking out, Judge Davies surveyed the tense scene before him. To his left sat the defense, to his right the prosecution, poised for the start of the morning’s proceedings.Outside on Chambers Street, a veritable circus prevailed. Ever since the discovery of Burdell’s bloodied corpse on the morning of January 31, crowds had gathered where there was action, seeking admission to the coroner’s inquest, peering through the windows of the house where the murder took place, trying to see and touch the core of gruesome reality that the crime embodied. New York newspapers provided front-page coverage of the case from day one. 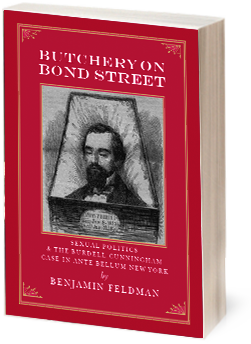 Transcripts of the testimony before Coroner Connery’s jurors, character sketches, editorials, and letters to the editor signed with pen names such as ‘Justice,’ fed readers’ appetites to know the circumstances of Burdell’s death and the role played by Emma Cunningham. During her pre-trial incarceration, the defendant was bedeviled by curious strangers traipsing through the open corridors in the Tombs, depriving her of any privacy or rest for most of three months. Legions of the men and women peered shamelessly into Emma’s jail cell, eager to bear witness to what many considered the incarnation of evil. . . .
Butchery on Bond Street is author Benjamin Feldman’s first book, published in 2007 with favorable reviews in The New York Times, The New Yorker, The Forward, The Brooklyn Daily Eagle, and featured in other newspapers and radio programs in the US and Canada. TO PURCHASE THIS BOOK, EMAIL THE AUTHOR AT FELDMAN_BENJAMIN@HOTMAIL.COM FOR A PRICE INCLUDINNG TAX AND SHIPPING SUBSTANTIALLY BELOW AMAZON OR ANY OTHER VENDOR.